While no one officially "owns" Antarctica, over twelve countries claim to have rights to at least a portion of it. Antarctica is the most isolated of the seven continents, and is called home only by penguins and a few other species of animals, as well as scientific researchers from around the world. That does not mean, however, that no country has tried to claim it in the past or present. In fact, it appears that many countries feel entitled to segments of its territory today. Antarctica is an important geographic location because it is the location of the Earth's South Poles. There are, in fact, four different South Poles: The Geographic South Pole, the Inaccessible South Pole, the Geomagnetic South Pole, and the Magnetic South Pole. Earth spins around an axis, and the Geographic South Pole is where the axis intersects Earth’s crust. The Inaccessible South Pole (also called the Pole of Inaccessibility) is the point at which Antarctica is furthest from the shoreline. In other words, it is the most landlocked location on the continent. Its name is derived from its geographic location, and not the actual difficulty in reaching it. The Geomagnetic South Pole is where the geomagnetic field intersects the Earth’s surface. This is different from the Magnetic South Pole, because Earth’s geomagnetic and magnetic fields do not perfectly align. The Magnetic South Pole is where Earth’s magnetic fields intersect the crust. The location of this pole is constantly changing due to magnetic drift, which is caused by the constant movement of iron under the crust, shifting the orientation of Earth’s magnetic field. The United Kingdom was the first to lay territorial claims to Antarctica. Their first ship landed there in the early 1800s, and land was claimed by the explorers and crew members who stuck British flags into the ice. Due to the harsh climate, Antarctica was not colonized. Since no settlements were established, Antarctica remained free from land claim disputes. This unclaimed status was maintained until the early 1900s, when the United Kingdom claimed segments of Antarctica. They decided which parts qualified as theirs by pinpointing the extents of their naval explorations around the coastline of Antarctica, and then drawing straight lines inwards to the Geographic South Pole, claiming all of the parts of the land within those boundaries. Other countries followed suit, including France, Norway, and the German Nazi Party. In the middle of the 20th Century, Argentina and Chile laid claims on lands within UK’s supposed territory. Britain was too busy with the Cold War to take any sort of action at the time, but later on it became a point of consternation. This took place just before the USA and Soviet Union both agreed that they would not claim land on Antarctica yet, but that they had a right to do so in the future. This conversation led to the 1959 Antarctica Treaty. These rules meant that Antarctica was to be left to scientific researchers and nature, with a goal for minimal human-derived negative impacts. Because Antarctica is strictly scientifically purposed, it is forbidden for researchers to leave any evidence of having been there. Any garbage or waste of any kind generated while in Antarctica must be brought back out of Antarctica. “Nothing contained in the Treaty shall be interpreted as: (a) a renunciation by any Contracting Party of previously asserted rights of or claims to territorial sovereignty in Antarctica." This is often reflected by the territorial lines presented on maps, outlining different segments as belonging to one of the initial treaty-signing countries. There is one large segment of Antarctica that has been left unclaimed, since it was not part of anybody’s supposed territory at the time of the treaty. This is the largest segment of unclaimed land on Earth, and it cannot be claimed because the treaty states that only contracting countries could hold territorial claims over Antarctica. Due to modern technology, it is now possible to build structures that can be populated all year round on Antarctica. This has been done by many of the countries involved in the 1959 treaty, all of which only built stations exclusively within the land they claimed. This is somewhat strange, because part of the treaty stated that everyone should share Antarctica without reference to territory. Other countries, such as China, have built stations throughout Antarctica without reference to where any pre-established and outdated claims existed. 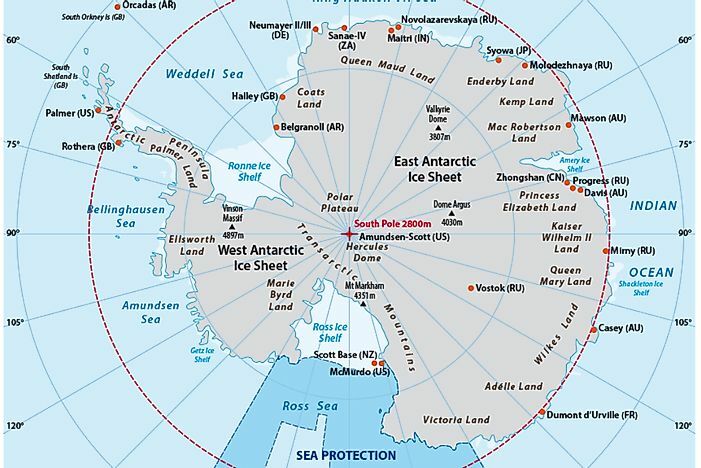 It is possible that there are a lot of oil reserves in the Antarctic region, meaning that the second stipulation in the 1959 treaty regarding land use could be at risk. It states that there would be no mining on Antarctica, but this could potentially become a point of conflict. It also contains 70% of the world’s fresh water, which is another increasingly valuable resource. For now, however, Antarctica is still being used as it was intended: as a nature reserve and a scientific research center. Who Owns the Panama Canal? What Are The Origins Of The Names Arctic And Antarctica? Does Antarctica Have Its Own Flag?